Cheeky Chicagoan rap mistress Kid Sister crept onto the end of my Top 10 albums of 2010 last week, pushing out the likes of Kanye West and (somewhat disappointingly) Kelis. If you haven't come across this feisty femcee yet, imagine Salt-N-Pepa's bouncy, exuberant flow over Detroit Electro-House backing tracks and you'll be some of the way there. It's big, cartoonish party music for the raising of arms, the grinding of hips, the dislocation of joints, the agony of physiotherapy and the limping like an old man. 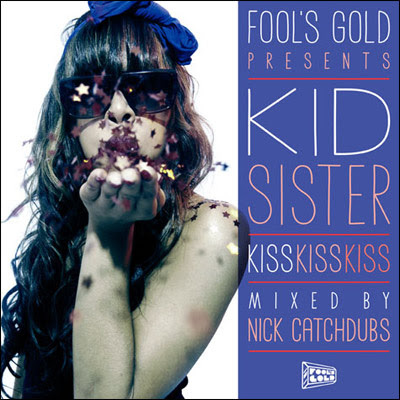 As a thank-you gesture for that Best Album accolade*, Kid Sister has released Kiss, Kiss, Kiss a mixtape of new songs, old songs and fresh remixes which you can download for free from this website. The highlight is a souped up cover of Debbie Deb's Lookout Weekend, a classic freestyle dance jam from 1984. I've posted the original and the Kid Sister version below. Enjoy!